Engineered and built to offer great features at an economical price, the AL2-11KC-DX features and designs will make this the most used lift in your garage. With versatile user-friendly Bi-Symmetric™ Configurable arms, 3 stage front arms, symmetric columns, single point lock release, low profile arms, rubber door guards and spin up pads with 2 " and 4" stackable truck adapters offers everything you'd expect and more! This BelAire compressor comes complete with everything you need to optimize your work and minimize down time. 2-Ton Trolley Jack with built-in safety valve protects against ram over-travel and heavy-duty steel construction ensures long term durability. This impact wrench brings you a free speed of 10,000 RPM at 90 PSI, with the maximum torque of 75 ft. /lbs. It gives you the power you need with the comfort you desire. 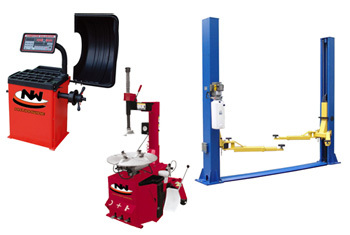 Basic wheel weight set for any brand of tire changer or wheel balancer. 4. Upon delivery of goods, the Customer has sole responsibility to notify Auto Lift Distributors of missing parts or concealed damage within 72 hours of receipt. If no notification of missing parts or of concealed damage is made, all parts will be purchased after 72 hours has passed. 5. The Customer must notate on the freight receipt any visible damages to packing and/or equipment. The Customer has the right to refuse any shipment that appears to have been damaged or mis-handled in shipping. If the customer signs “clear” on visible damage, the freight company will reject the claim, thus making the Customer liable for any charges to replace equipment and/or parts. 6. The customer must make arrangements to unload the equipment from the freight trailer, no labor or equipment rental will be paid by Auto Lift Distributors. Stackable Truck Adapters Set of 4 each: 2" & 4"
Clip-on weights for steel application: 0.25 oz., 0.5 oz., 0.75 oz., 1.0 oz., 1.5 oz., 2.0 oz., 2.5 oz., 3.0 oz. Adhesive weights: 52 strips - 6" long with (12) 0.25 oz. squares per strip.